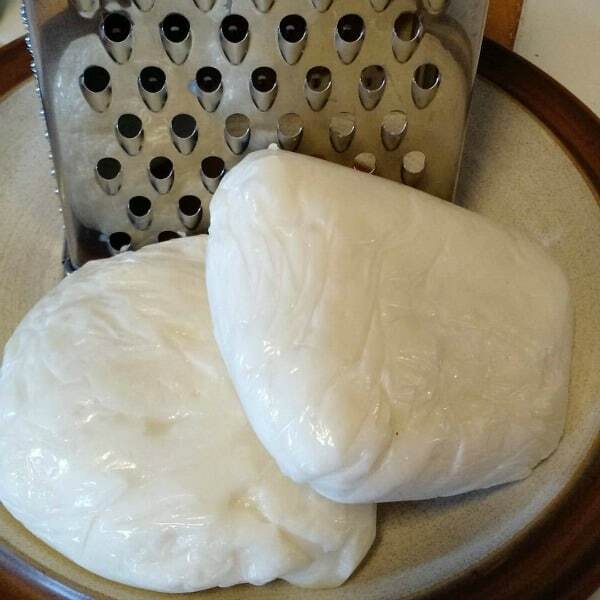 The first time I made mozzarella from our goat milk I ended up with crumbly, dry curds that wouldn’t stretch and ended up being pretty useless for any sort of cooking or eating. I’ve learned a thing or 2 since that first batch and now we are getting pretty good curds that stretch nicely, taste like real mozzarella and grate beautifully for pizza! If you have made mozzarella before you will be familiar with the “30-minute mozzarella” process. This goat milk mozzarella recipe follows that process with a few tweaks. The first, and probably most important, part of the recipe is the milk. 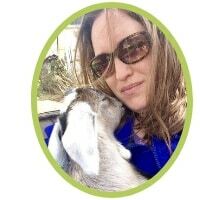 In most cheese-making, yogurt-making, etc you want to use the freshest milk possible, but when it comes to goat milk mozzarella you want to make sure your milk is about 3 days old. We get about 1/2 to 3/4 gallon of milk per day, so we just set that jar aside in the fridge for 3 days. We have used a mixture of 4-2 day old milk if we needed a larger batch and still had good success. Start by dissolving 1/4 tsp of citric acid in 1/4 cup cool water. Pour the citric acid water into a large pot and pour the goat milk over top and give it a quick stir. 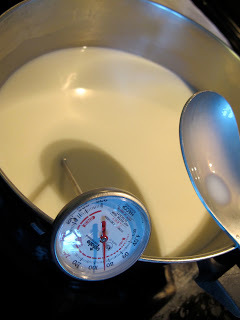 While the milk is heating go ahead and prepare your rennet and lipase if you are using it: dissolve 1/4 tsp rennet in 2 T cool water, and 1/8 tsp lipase in 1/4 cup cool water. When the milk comes to temperature gently stir in the lipase followed by the rennet. Mix well using up and down strokes. Place a lid on the pot and set it aside for about 30 minutes- or until the curd forms a clean break. Once the 30 minutes is up, cut the curds into about 1 inch cubes and transfer to a colander placed over a bowl. Drain off as much of the whey as you can. In a pot large enough to hold your colander, heat up water to 140 F.
Cut or tear any curds that are too big into to smaller 1-2 inch pieces. Dip these drained curds into the hot water. We submerge them for about 30 seconds the first time and start testing if they are ready to stretch. When the curds are sufficiently warmed, sprinkle them with cheese salt and start to stretch and pull the curds. 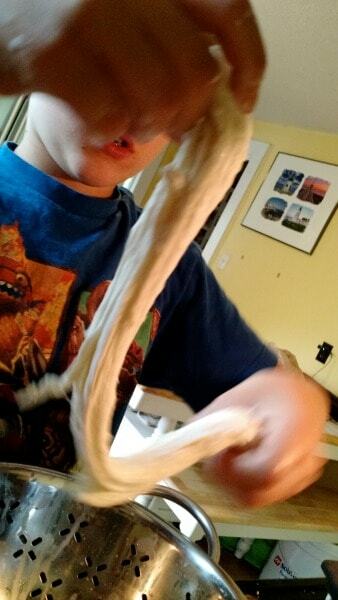 You want to stretch it like taffy until it is smooth and glossy. You may have to reheat the curds by dipping for 10 seconds or so throughout the process. You can pull off small bits to check the flavor and add more salt if desired. Shape the cheese into a ball and run under cool water for a few minutes. Wrap tightly and place in the fridge for at least a few hours before using. If you like this recipe, check out it and 24 other fabulous goat milk recipes in my Goat Milk Recipe e-Book! 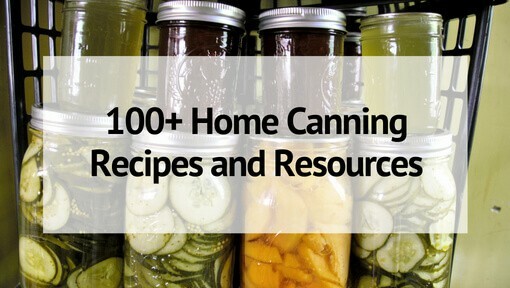 With recipes for cheeses, yogurt, kefir and treats like ice cream and fudge! Remember to use 3 day old milk!! This addition alone to your old recipes can help to make all the difference. Try not to let the curds get above 150F. Aim for 140 F and you should be good. Milk can be fickle and a lot depends on the pH. If you still get dry crumbly curds, consider reducing the citric acid a bit to see if that helps. Good luck! 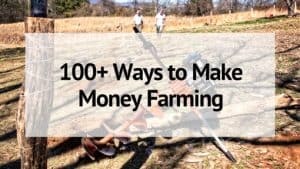 Let me know if it works for you! Have you tried freezing it? I’m going to be drying up my doe in September to breed again and would like to have a stash in the freezer. I have froze the balls and they work just fine. If you grate the cheese, before you package it sprinkle a small amount of arrow root powder or corn starch on the cheese and toss together to cover the cheese well. This will keep the cheese from sticking together. Thanks for the tip on the amount for pizza! That’s what I need mozzarella for, too. It’s one of the only things we still consistently use cheese for and I’m really tired of buying it because the good stuff is expensive! 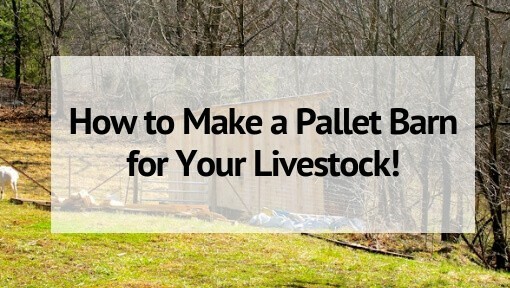 I am so glad to have found this recipe! I have had no luck making mozzarella with my goat milk, so will be trying this very soon. Can I ask what the lipase powder is for? Just curious – does it help in curd formation or is it an optional addition more like salt for flavor? thanks! So, to be clear, I don’t NEED lipase, it just improves quality? In that case, is it at all possible to do this without rennet? Or is there no substitute? No, Lipase is not necessary. Rennet you need- though there may be substitutions out there that will work, but I’ve not tried them. I use the microwave in lieu of the hot water bath. Heat the curds in the pot to 102-105 while gently stirring. Then drain and put cheese mass in microwaveable bowl and nuke for 1 minute 35 seconds…take out, pour off milk and stretch. Put back in for 35 seconds and then stretch again and add salt. Sometimes it takes 2 trips to the microwave and sometimes 3. Turns out just as good. What do you wrap it in…cheese cloth? I tried this the other night and failed miserably lol. At 88 degrees I added the 2 ingrediants and took off the heat, covered and waited. The curd looked just like the picture above. I cut it into squares. How do you transfer to the colander? Do you spoon it or pour it? How long do you let it drain? I would take one of the squares and dip it then try to stretch it, if it didn’t stretch I would dip it a little longer and try again. It just kep pulling apart but wouldnt even start to stretch. I finally got frustrated and wadded it all up, wrapped it and put in fridge. Next morning I had a ball of cheese the consistency of hard Parmesan. Any Ideas where I went wrong. I’m going to milk again tonight and try again sunday. 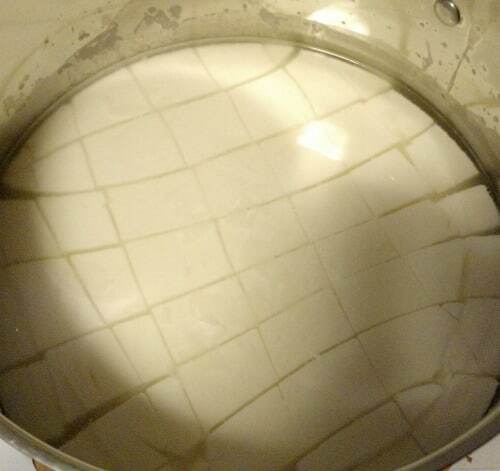 I use a large slotted spoon and put all of the curds in a colander and let them drain a few minutes. Then I round up the curds into one chunk (2 if it’s a large batch) squeezing out a bit of the whey as I do this. Then dip the whole thing. I also tried this and failed. My curd set up beautifully, and held up and looked great as I dipped them into the cplander to drain. But when it came time to heat them up to start stretching, they never got “elastic” just keep breaking in chunks. Even if I dipped them and let the money stay longer. I even checked the ph of my milk when i started and it was in the ideal range. Just don’t know what I’m doing wrong. I’ve tried many different recipes, and thought this one was sure to work. My attempt was just like yours. I won’t be wasting my milk again. This recipe, like a cow’s milk recipe, worked great until the stretching step (my water was at 140 degrees, never above). My curds never got soft. They were crumbly like store bought parmesan cheese in a shaker. Rubbery mouth feel and just gross. I won’t be wasting my goat milk on mozzarella recipes again. I’m so disappointed.